The plum blossoms are at full strength, the white magnolia in my backyard is covered with so many blossoms that it looks like a performing waiter balancing a thousand ceramic cups on a thousand arms like some kind of woodland Shiva, and the songbirds have returned to scope out all the good early nesting opportunities. It’s the beginning of spring and that means that in another week or two the cherry trees are going to explode into blossom. Before that happens I thought I might write something about winter flowers, the snow blossoms of Yoshino. Mount Yoshino, in Nara Prefecture, is one of the most famous places in Japan for viewing cherry blossoms. There are thousands of cherry trees on the mountain, planted at different levels so that the trees bloom at different times throughout the spring. In fact, the cherry trees of Yoshino, which are said to have first been planted over 1,000 years ago, gained such a reputation for splendor over the centuries that the somei-yoshino (染井吉野) has become the most widespread type of cherry tree in Japan. 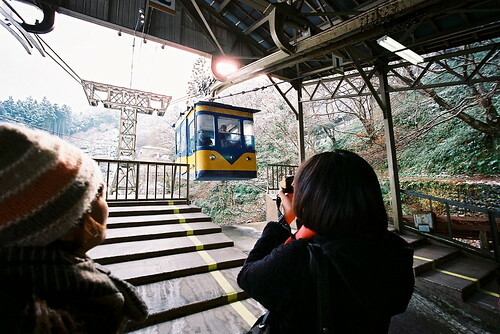 Because Yoshino has been a popular destination during cherry blossom season for hundreds of years, it was one of the first places in Japan to get an aerial ropeway. The Yoshino Ropeway, which was built in 1928, is now Japan’s oldest surviving aerial ropeway and is as much a tourist attraction as the blossoms themselves. I thought it must have snowed. The reverse is true as well. When the snow drifts down on the bare branches of the cherry trees, it makes snow blossoms. None of the group of five of us that decided to make the visit to Yoshino in early December had ever been before, and though it might seem strange to choose winter as the time to make your first visit to a site renowned for its spring blossoms, there was a good reason to go when we did. Three reasons, in fact. All of them giant and blue. 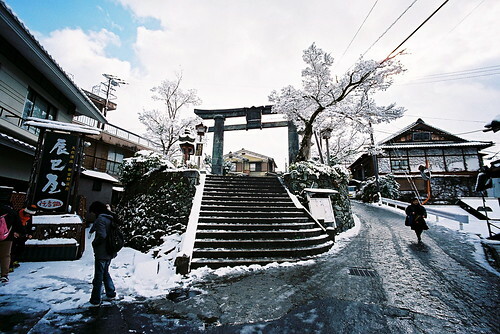 Kinpusen-ji (金峯山寺) is the head temple for one of the major branches of Shugendo, a form of ascetic mountain Buddhism. 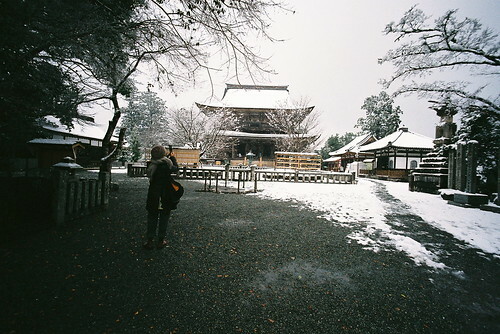 It’s main hall, which is either the second or third largest wooden structure in Japan, is called the Zaōdō (蔵王堂) because it houses three enormous Zao-Gongen statues. The statues, which you can see here as long as you make sure to expand the page where necessary, are each between five and seven meters tall and portray three aspects of Zao-Gongen, represented here as a violently angry blue deity, an appropriate image for the protector of mountain ascetics. The blue Zao-Gongen statues, which were most likely carved in the 17th century, are normally hidden behind closed doors but were open for public viewing for about a month last year. We went to see them on the last weekend that they could be viewed, and they were magnificent. It turns out that there’s a connection between Zao-Gongen and the 30,000 cherry trees on Mount Yoshino. En no Gyoja (役行者), a quasi-historical mountain ascetic who is considered to be the founder of Shugendo, is said to have had a vision of Zao-Gongen after having spent a thousand days in the mountains practicing physically grueling forms of meditation. He carved an image of his vision from a piece of cherry wood and then enshrined the cherry statue of Zao-Gongen in the Zaōdō at Kinpusen-ji. 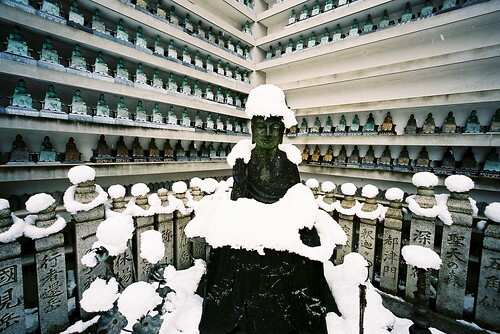 Though the original statue has been lost, hundreds of copies were carved out of cherry wood by mountain ascetics as a tribute to En no Gyoja’s vision. 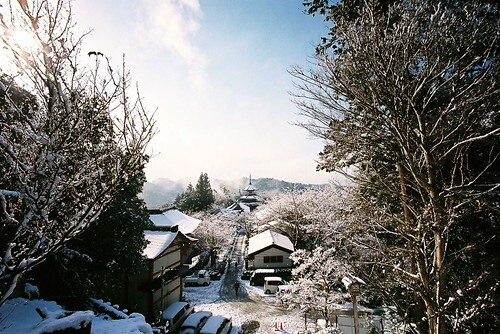 According to Kinpusen-ji’s English-language pamphlet, the cherry trees on Mount Yoshino were planted by devotees of Shugendo to commemorate the first carving of Zao Gongen, and all of the trees in the mountains are worshiped as manifestations of Zao Gongen. When the cherry blossoms explode in spring, you might be looking at the fires of Zao Gongen. Of course, visiting with mountain deities isn’t the only thing to do on Yoshino. It’s also a good idea to eat udon in a warm noodle restaurant that’s perched over a view of the snow-covered valley below. You should also get a plate of Nara’s famous kaki-no-ha sushi (柿の葉寿司), sushi wrapped in persimmon leaves. Or you should throw snowballs. 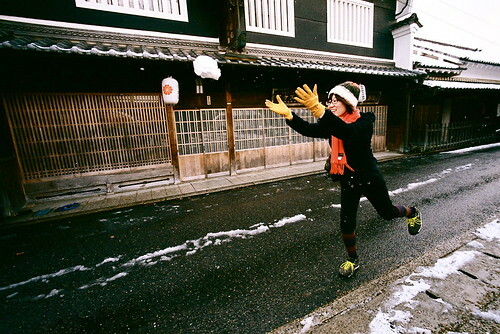 Or make yuki daruma (snowmen). go searching for blossoms in directions I’ve never been before. 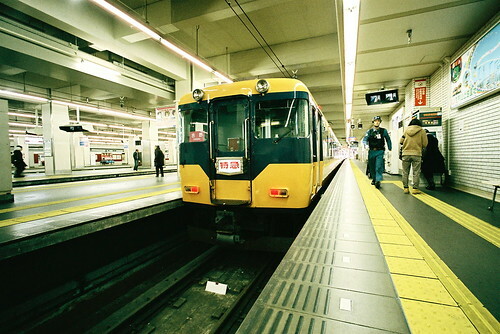 A photo of a the train that takes you from Osaka to Mount Yoshino might seem like a strange note to end on, but there’s a reason to end at the beginning. All of the shots used in this post were taken with a Voigtlander Bessa-L equipped with a 15mm Heliar lens (one of my favorite lenses). I brought a second camera, however: a Voigtlander Bessa R2A equipped with a 35mm Ultron. But there are no R2A shots of this trip to Yoshino because while I was getting on the train I managed to drop the R2A in the space between train and platform. There was no way the attendants could get the camera while the train was still at the platform, so I had to leave the R2A behind on this trip and retrieve it from the station office once we got back. Since the R2A still hasn’t been to Yoshino, I’ll have to make another trip. This time in spring, for the blossoms.